You've seen prints and you've seen collages, and maybe you've even seen both in a single creation at the same time, but you've never seen them quite the way Tony Fitzpatrick renders them – on notebook-sized paper, with a stunning arrangement of symbolic images building complexity into his highly effective choices of balance and color. This is "No. 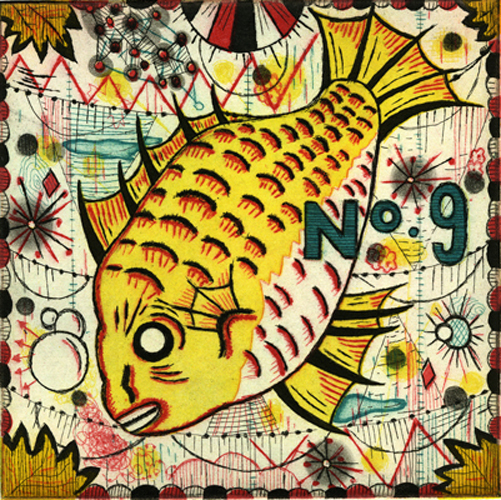 9, An Artist's Journal," a long-running series of original illustrations conjuring and conjured by the artist's daily musings and his travels around the world. Tokyo, Chicago, New Orleans: These cities and others provide the inspirations for (and sometimes subtly influence the style of) his spectacular creations. Gods, of course, reside in heaven; and we're suggesting that, with this Fitzpatrick show on its walls, (Billy Shire Fine Arts) is currently, graphically, one of the earthbound neighborhoods of that realm. 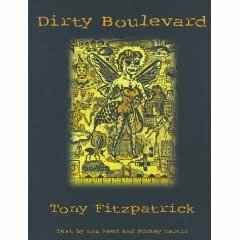 Tony Fitzpatrick is an artist, poet, and actor whose artwork can be found in the collections of the Museum of Modern Art in New York City, the National Museum of American Art in Washington D.C., the Museum of Contemporary Art in North Miami, the Museum of Contemporary Art in Chicago and the Philadelphia Museum of Art. His recent exhibitions include solo shows in New York City's P.S.1 - MoMA and Pierogi Gallery in 2007 and in the Sidney Yates Gallery of the Chicago Cultural Center in 2008. In the same year his work was also shown at the First Biennial in New Orleans at Prospect One. In 2009 he has had one-person exhibitions in New York City at Dieu Donne, in New Orleans at Ammo Gallery, in Illinois at the Rockford College Museum, in Austin at Slugfest Gallery, and in Los Angeles at Billy Shire Fine Arts. In January of 2010 he will be exhibiting new work at Pierogi Gallery in New York City. His work has also appeared on album covers including The Neville Brothers' Yellow Moon and Steve Earle's El Corazon and The Revolution Starts Now. Tony has made a living as a radio personality, construction worker, and as a film, stage and television actor. He has appeared in 15 major motion pictures including The Fugitive, Married to the Mob, Mad Dog and Glory, and Philadephia. Recently he appeared in The Promotion directed by Steven Conrad. In 1991, Tony earned the Joseph Jefferson Award for Best Actor in Prop Theater's production of Mass Murder. In the summer of 2003, Tony starred in Lookingglass Theatre's inaugural production of Race, an adaptation of a Studs Terkel novel directed by David Schwimmer. 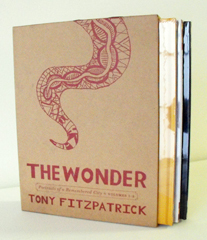 Tony has published seven books including three collections of art and poetry: The Hard Angels (1988), Dirty Boulevard (1998) and Bum Town (2001); a collection of etchings entitled Tony Fitzpatrick: Max and Gaby's Alphabet (2001) and three collections of drawing-collages entitled, The Wonder: Portraits of a Remembered City, Volume 1 (2005), The Wonder: Portraits of a Remembered City, Volume 2, The Dream City (2006), and The Wonder: Portraits of a Remembered City, City of Monsters, City of Ghosts (2008). 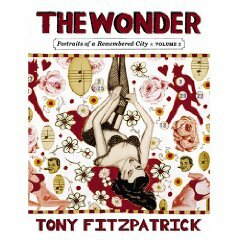 Tony Fitzpatrick was born in Chicago in 1958 where he lives today with his wife and two children. 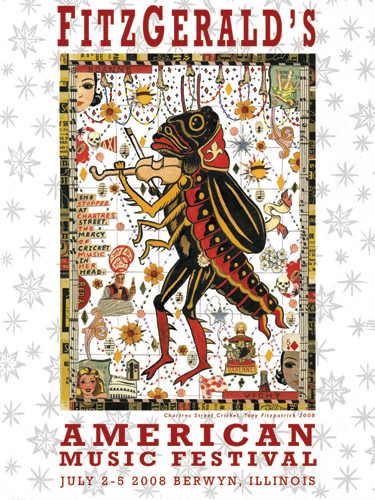 Tony Fitzpatrick spins magical tales from his own history and that of his beloved city via drawing-collages, vivid combinations of drawing, text and applied elements like matchbooks, postcards, gambling slips and ballgame stubs. In this gorgeous book, Fitzpatrick introduces the first set of drawing-collages as chapters in an ongoing project that is both personal diary and chronicle of Chicago. Includes 35 color plates. 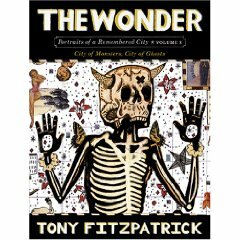 In this follow up to Volume 1, Tony Fitzpatrick spins magical tales from his own history and that of his beloved city via drawing-collages - vivid combinations of drawing, text and applied elements like matchbooks, postcards, gambling slips and ballgame stubs. Alex Kotlowitz is author of There are no Children Here, The Other Side of the River, and Never a City so Real. He also writes for The New Yorker and The New York Times. 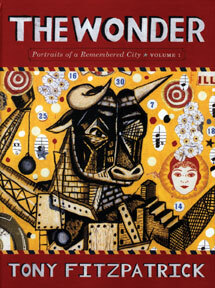 This is the final of the series on Chicago, the culmination of Tony Fitzpatrick's interpretations of his hometown. Along with the first two volumes, we see a full vision as Fitzpatrick intended it. 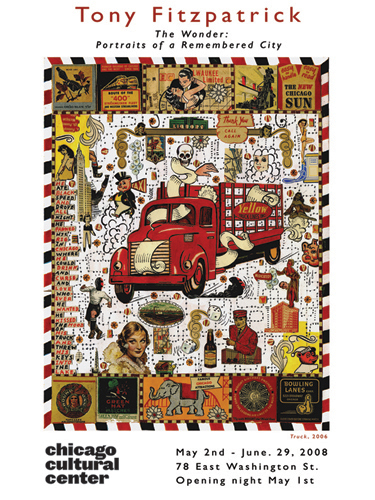 Tony Fitzpatrick's works are in the collections of the Art Institute of Chicago, the Museum of Modern Art in New York and the Museum of Contemporary Art, Miami. Among his works are the drawings which make up the brief chapbook Bum Town, and a continuing series of drawings/collages with poetry. "A modern master of etching, up there with all of my favorites Goya, Blake, and Dix." "Tony...had a front row seat at my long drawn out attempted suicide...I'm in these pictures. So's Tony." This series of drawings is a frantic telling of the tragic tale of too many lives shaped and circumscribed by the misguided war on drugs waged daily in the streets of our cities.